Set V is a popular trophy set amongst Car Shows as well as other venues. This trophy set features round and square columns on the 1st Place trophy and square columns only on 2nd through 4th place. 1st Place is a two column trophy measuring 33 inches tall, 2nd Place is a single column trophy measuring 24 inches tall, 3rd place is a single column trophy measuring 23 inches tall, and 4th Place is a single column trophy measuring 22 inches tall. All heights are based on a 5 inch figure and heights may vary depending on the figure selection. Engraving is free!! 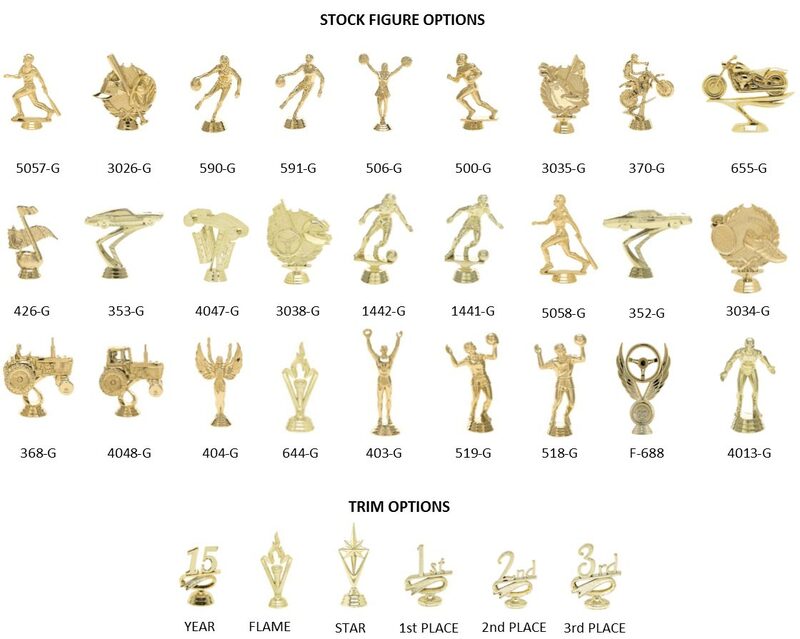 TROPHY KITS AT THE TROPHY OUTLET ARE AN AFFORDABLE WAY TO GET THE AWARD THAT YOU WANT WHILE SAVING MONEY AND ASSEMBLING THE AWARD BY YOURSELF. OUR TROPHY KITS COME COMPLETE WITH ALL THE PARTS NEEDED TO ASSEMBLE THE AWARD, ALONG WITH STEP BY STEP INSTRUCTIONS, AND A PARTS LIST SO YOU KNOW WHAT ALL YOU HAVE. PARTIALLY ASSEMBLED TROPHES COME PACKED AS ASSEMBLED AS WE CAN TO MEET SHIPPING REQUIREMENTS. MOST OF THE TIME THEY COME WITH THE RODS AND COLUMNS PRE ASSEMBLED, ALL YOU HAVE TO DO IS ADD THE BASE. IF YOU WOULD LIKE US TO SHIP YOUR TROPHIES FULLY ASSEMBLED PLEASE CONTACT US FOR DETAILS. ADDITIONAL SHIPPING CHARGES MAY APPLY. Click the button below to add the Set V to your wish list.